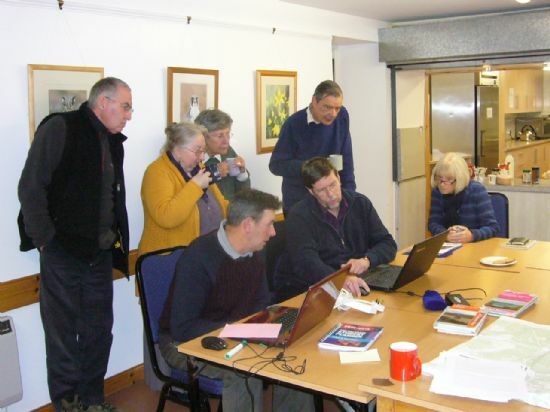 In 2014 ARCH provided a number of courses, field trips and other activities exploring and researching the remains of the 19th century engineer, road and church builder Thomas Telford. Thomas Telford was an extraordinary man – one of the first project managers – and his works in the Kyle of Sutherland transformed the area in the first decades of the 1800s. Many people know about his innovative iron bridge at Bonar Bridge, which sadly was destroyed in floods in 1892, but there are many more remains still surviving.Participants researched many of these, including delving into works at the Highland Libraries, and created a display and a leaflet allowing people to explore the remains in the area. They have also created geocaches at two of the sites. The display and leaflet tell the story of what the area was like before Telford began his work for the government, what he did in the area, and what the impact of these building projects was. The current main road network in the area remains as Telford built it, although widening and straightening has occurred on many sections. 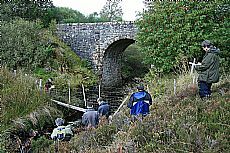 A few bridges dating to the period survive, including a previous unrecorded one south of Lairg which the group made a detailed survey. There are also a number of culverts, including a well preserved one near Little Ferry which may well be original. 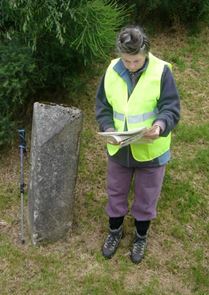 Milestones were also erected along the new roads, and the group went looking for them. Strangely on the Sutherland side of the Firth the surviving examples are in concrete, while on the Ross and Cromarty site they are stone with chiselled destinations. It is likely that these are modern replacements – and in some cases it is clear that they have been moved from their locations in the 1870s. There were also short-lived toll houses though none survive. The new road network had a profound impact on the area, including the development of Bonar Bridge which became a central hub when the decision to cross the Firth here was made. The roads also led to a number of new coaching inns, as well as upgrades to others. Telford's friend, the poet Robert Southey, travelled in the area shortly after completion of the roads, and has provided first hand accounts of the roads and inns. In addition to roads, Telford was involved in a government initiative to build churches in the Highlands and Islands. To overcome the distance most rural people had to travel to church the Government provided funds to build “Parliamentary Churches” with a manse. Telford produced a common design for all churches and manses to be built on land provided by the local landowners. Built for a population of 500 in 1827, Croick church is still in use. It cost £1426 including the manse. Seating 200 it has no balcony and is one of the smallest. The interior remains little altered. While sheltered in the churchyard, people evicted in the “Glencalvie clearances” scratched messages on the east window. Binders of resources with further information have been deposited in the Bonar Bridge Library and the Kyle of Sutherland Heritage Society, and the Telford trail leaflets will be available from a number of local sites. The project was funded by The Robertson Trust and the E.ON Rosehall Community Fund managed by Foundation Scotland.